A very smoked in sun today. In fact this is the most we saw of the sun all day. 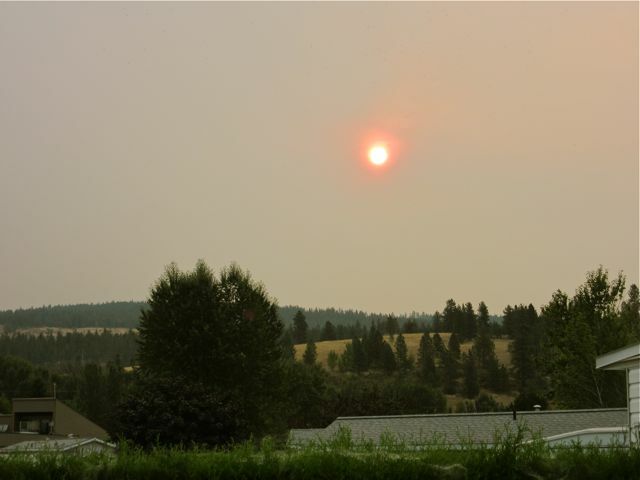 Another extremely smoky day. We were surprised that it appeared to be even smokier in town today but then Kelowna is closer to the Peachland/Summerland fire than we are. While in town we stopped in at Costco to pick up a fillet of wild salmon as Colin is going to be home for dinner tomorrow. All they had was Atlantic farmed salmon which we refuse to buy. But they did have some very fresh nice looking thick tuna steaks. Does anyone have a suggestion how to prepare them? BBQ or ?? We have never cooked tuna before so we are looking for your suggestions. Marinade , yes or no? A special sauce perhaps? Looking forward to hearing from you. As we were in town this afternoon and rather hungry we stopped in for a very tasty dinner of vegetable tempura and teriyaki salmon with rice and stir fry veggies. I might not eat for another week. A great meal for only $15.00 each. Colin never got in till about 9:45PM last night but I did have a dinner of quiche and salad waiting for him. We certainly don’t have a set time when we eat. Last night at 10PM and tonight at 5:30PM! 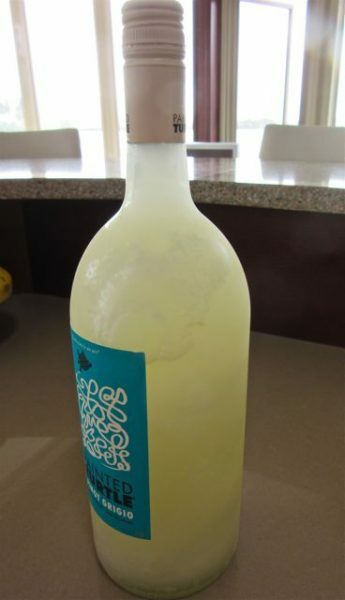 I thought that we might run out of wine so I put a bottle in the freezer to chill. Turns out we did not drink much wine and didn’t finish the opened bottle. Guess what? I forgot to take the bottle out of the freezer. Normally I set the timer for 30 -40 minutes to remind me. So this morning Colin found this in the freezer. It was frozen solid but the cap stayed on, perhaps because it was a screw cap rather than a cork. I just now opened the bottle at 8:30PM and it is just as good as ever. I do love my wine chilled. I love tuna steaks done on our Weber Q here is the link on my recipe blog to the recipe that I use. Never have fixed tuna steaks so no suggestions. Only fixed tuna steak once and was not too pleased but I messed it up by cooking it too long. My niece cooks tuna steak – she uses the Blackened Spices and cooks it on top of stove in a very, very hot iron skillet for just a short time watching carefully – leave it pink in the center. Over cooked….not good. Looking forward to learn how you cook it – I need to try again. Be sure to share the recipe you use to give me courage to try again. The picture, “sunset last evening” looks very peaceful. I could sit outside on your deck and have a glass of wine with that and of course the other three of you! George and Sandy have it right. A properly cooked tuna steak should be almost raw in the middle. It also should need much seasoning, just a bit of salt and pepper and maybe some lime or lemon juice. Mmm… remembering that awesome tuna tapa in Almería! As for the meteor, I’m still in shock. Wow beautiful picture of the sunset! It was so smokey in Kelowna that I couldn’t see the sunrise during my walk this morning. 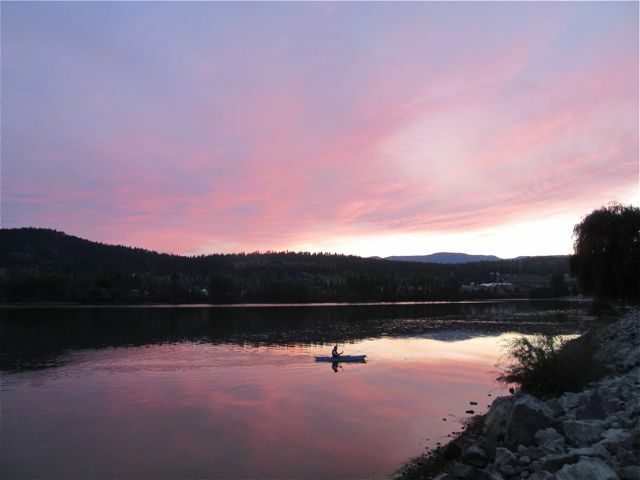 We are having a little Okanagan Bloggerfest on Monday at Bear Creek Provincial Park, 3:00 p.m., Six Saturdays and a Sunday and Driving Miss Murphy are coming. We would love to have you join us if you are available!